Following national concerns, the SA government has announced funding for widespread screening for stone industry workers for silicosis. South Australian stone industry workers will be able to access immediate health screening after a rise in detections interstate of the incurable respiratory disease 'silicosis'. While there have been no confirmed silicosis cases from the engineered stone benchtop industry in SA to date, treasurer Rob Lucas has approved funding of $400,000 to screen workers. "There is currently considerable national attention given to the issue of silicosis, and our immediate $400,000 funding for health screening of local workers in the engineered stone industry will help ensure we support the important work already underway at both a Federal and State level," Mr Lucas said. In recent weeks there has been a spike in silicosis detection rates interstate, particularly in Queensland where as many as 69 of almost 700 workers screened were diagnosed with the disease. There are about 140 employers of stonemasons in South Australia. 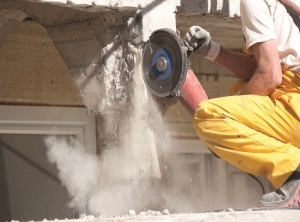 Silicosis is an incurable lung disease caused by the inhalation of crystalline silica dust - a common component of granite and other rock used in the manufacture of stone benchtops for kitchens, laundries and bathrooms.